Mari Hiki (比企真理), born March 15, 1968, Tokyo), better known by her stage name Kahimi Karie, is a Japanese Shibuya-kei musician. Kahimi Karie began her career as a music photographer in Japan. Her then-boyfriend, Keigo Oyamada (aka Cornelius) asked her to sing for his friend's record label. 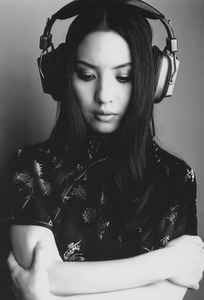 Kahimi quickly gained success, especially on the hyper-trendy Shibuya-ku scene (the fashionable Tokyo hub and area also associated with the musical talents of Pizzicato Five, Fantastic Plastic Machine, Maki Nomiya and Cornelius, among others). Many of Kahimi's EPs achieved gold status in Japan. She also hosted one of Tokyo's most popular radio programs. Kahimi caught the attention of Momus, and the two began collaborating. Several domestic hits followed. "Good Morning World", a song commissioned by a cosmetics company, reached top five on the Japanese charts and cemeted Kahimi's position as a J-pop superstar.